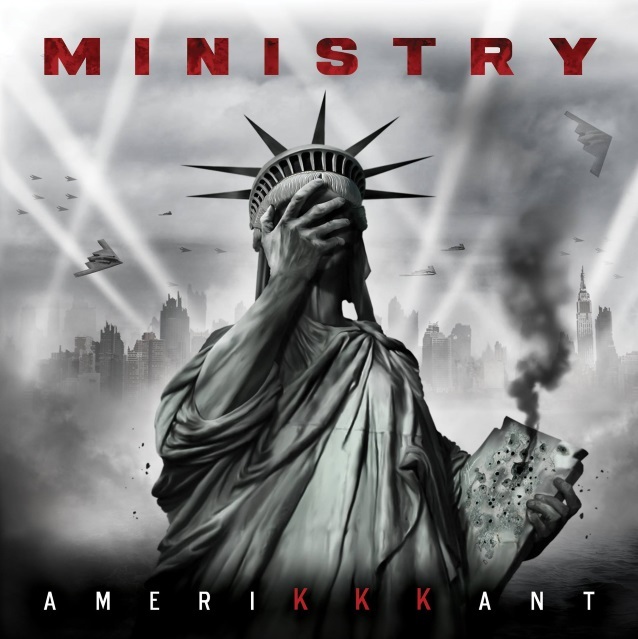 Industrial metal veterans MINISTRY will release their new album, “AmeriKKKant”, on March 9, 2018 via Nuclear Blast Records. The disc will feature guest appearances by DJ Swamp (Beck), Burton C. Bell (FEAR FACTORY), Arabian Prince (N.W.A.) and Lord Of The Cello. Produced by mainman Al Jourgensen, recorded at Caribou Studios in Burbank, California between January and May this year, and with striking artwork created by Mister Sam Shearon, the album’s psychedelic, politically influenced and very much in-your-face nine tracks are rooted in Jourgensen‘s unadulterated anger for what’s happening in America today — the waning respect for the U.S. Constitution, the growing acceptance of one’s opinions replacing facts, the decline of our leaders’ sense of morals, ethics and personal responsibility to the country and to their constituents, and the mad man in the White House. “This album, ‘AmeriKKKant’, will provide FEMA-type relief for the devastation ‘Hurricane Cheeto’ has brought upon us,” stated Jourgensen. The official music video for the song “Antifa” can be seen below. MINISTRY recently completed a North American tour with DEATH GRIPS as support.